LED grow lights have become extremely popular due to their ability to stay cool and produce high yields while using a small amount of electricity. Today’s LED models have fuller light spectrum, resulting in healthier and greener growth. 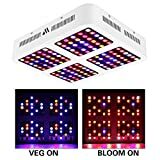 You should use LED grow lights if you want to use the best grow lights with a customized light spectrum, have extra money to spend on the initial setup and are willing to conduct some research to determine the right LED grow light for your grow space. Consider LED grow lights if you don’t want to install ducting or exhaust system or if the quality is more important to you than quantity. The Recordcent 1000W LED Grow Light has a conversion power rate of 90%, so there’s extremely less energy lost in resistance and transmission. It produces a 12 band spectrum, IR, and UV. The UV sterilizes the plants and kills the bacteria that can affect the plants in a later stage. The IR light promotes cell division in the plants and encourages them to grow faster. This will increase your yields. The grow light’s LEDs are attached to an aluminum substrate that serves as a heat sink. Heat is absorbed and sent out through the two built-in 80mm cooling fans. The grow light has 100 pieces of 5W LEDs that are brighter than 3W and 1W chips. These LEDs also have longer lifespans and use less electricity than other lighting systems. 89.8% of the light produced by the grow light can be used by the plants. The Recordcent 1000W LED Grow Light comes with a 4-month money back guarantee and has an average power draw of 120 to 130W, 120⁰ viewing angle and lifespan of 35,000 hours. Its maximum coverage is 2.5′ X 2.8′. The grow light measures 12.2″ X 8.2″ X 2.4″ and weighs 5.5 pounds. The package includes a wire hanging kit, 4′ power cord, Recordcent 1000W LED Grow Light and LED drivers. The grow light consumes less power than a 1000W HPS/EM and is simple to install. The manufacturer did not provide any recommended height setting for the weed’s different growth stages. Its lifespan is less than other grow lights. However, the Recordcent 1000W LED Grow Light is still a powerful grow light. Its full spectrum light, IR, and UV provide the plants with everything they need to grow faster. If you are okay with its lifespan, you will definitely like the grow light’s high power production and low power draw. MDR300 compares to traditional 250 watt HPS/MH while consuming only 140W±3%! Its strong, durable and compact reflector magnifies PAR and increases canopy penetration by up to 150%. The dual-dimmers will help plants at all stages of their growing life-cycle to ensure you get the best yield possible. A 2-year warranty (US based after-service center) plus 60-day hassle-free return guarantee. The MAXSISUN MDR300 LED Grow Light provides a full 12-band spectrum and infrared to plants to improve their metabolic processes. It only consumes 142 watts, while producing the same amount of output as a 250W HPS/MH. The grow light has dual dimmer switches that help the plants at every stage of its natural growth cycle. The MAXSISUN MDR300 is equipped with a built-in compact reflector that increases the LUMEN and PAR. This increases canopy penetration by as much as 150%. The grow light comes with a 60-day money-back guarantee and 3-year warranty. You can read the user’s manual to learn more about MAXSISUN’s LED grow light. Thanks to the dual dimmer switches, you can customize the LED grow light. The brightness of Bloom and Veg lights can be controlled from 0% to 100%. The light is produced by Epileds and Bridgelux 5W LEDs. These LED chips provide PAR output that is higher than a traditional HPS lighting system. The outer build of the grow light is made from a durable material, so you are assured that it will last for a long time. You can daisy-chain the LED grow light using only a single wall outlet. 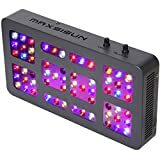 Here’s how you can use the grow light from MAXSISUN. Hang the light at the height of 24″ to 28″. Turn it on for 14 hours and turn it off for another 10 hours. Keep the Bloom light at 30% brightness and VEG light at 80%. Hang the light at the height of 18″ to 24″. Turn the grow light on for 18 hours and turn it off for another 6 hours. Keep the Bloom light at 50% brightness and VEG light at 100%. Hang the light at the height of 16″ to 20″. Turn the grow light on for 12 hours and turn it off for another 12 hours. Keep the Bloom light at 100% brightness and VEG light at 100%. The MAXSISUN MDR300 LED Grow Light has a maximum veg coverage of 3.5′ X 3.5′ and max bloom coverage of 2.5′ X 2.5′. It weighs 15.7″ X 8.4″ X 2.4″ and weighs 7.5 pounds. The package includes a 6′ power cord, hanging kit, user manual and MDR300 LED grow light. The manufacturer did not provide information about the grow light’s heat dissipation. However, the MAXSISUN MDR300 LED Grow Light still offers the features required in cannabis grow light. You can dim the Veg and Bloom light to accommodate the plant’s growth stages and ensure that the light doesn’t consume a lot of power. It comes with a money back guarantee and warranty, so you won’t have anything to lose. 【Advanced Full Spectrum】: The led grow light comes with super bright 120pcs Triple Chips, 52 Red+ 32 Blue+ 8 orange+ 8 Yellow+ 8 Warm light+ 8 White light+ 4 IR, which is similar to the sunlight, give off perfect wavelength for all growing stage. Suitable for seeding, germination, vegetative & flowering. 【Three Mode】: Veg mode or bloom mode or both mode on, provide your plants suitable light spectrum through their growing life-cycle to get the best yield. 【High Efficiency and Energy Saving】: The led plant grow lamp effectively replaces a conventional 1200 watt HPS grow light, while consuming only 233 watts! led grow lights can save more than 80 percent of electricity compared to traditional lights. 【Widely Used】: The led grow lights are suitable for all plants, flowers, vegetables, fruits and succulents. Perfect plant light for indoor plants, office, balcony, darkroom, home, greemhouse. 【Warranty Policy】: 3 year warranty and 30 days return guarantee and within 24 hours professionals customer service. morsen own factory and professionals to research, design and develop the products, best price for you! The MORSEN Reflector-Series 600W LED Grow Light has safety certifications from ROHS and CE. It’s designed to provide better coverage as well as LUMEN and PAR output. It can cover a growing area of 3′ X 2′. The grow light consumes only 116W, so it can help you save money on your electricity bills. It provides full spectrum light, IR, and UV, making it an ideal option for indoor cannabis growing. The red lights are for Bloom mode and promote better flowering and fruiting. The blue LED is for Veg period and is essential for growth and germination stages. The grow light has two on/off switches and 60⁰ reflector cups that make the light more concentrated instead and sends it to the plants efficiently. The reflector cups are very wide, so the plants get less intense light. The grow light from MORSEN has 60 pieces of 10-watt LEDs. Each LED has own zener diodes for protection. The MORSEN Reflector-Series 600W LED Grow Light comes with a 30-day money back guarantee and 3-year warranty. If you are not satisfied with its performance, you can get your money back. The LED chips have a lifespan of 100,000 hours and an average power draw of 116W, a viewing angle of 120⁰, maximum coverage of 3′ X 2′. It can replace a 600W HPS/MH. The grow light measures 9.3″ X 5.7″ X 2.1″ and weighs 17 pounds. The package includes hanging kits, Morsen 600W LED grow light and 4.5′ power cord. MORSEN’s grow light is affordable and super bright. It has a large coverage area. The grow light is a little heavier than other grow lights. However, if you are looking for a high performance grow light, you should consider getting the MORSEN Reflector-Series 600W LED Grow Light. COMPARE TO HPS/MH- The 600W LED grow light can replace traditional 400 watt HPS/MH while consuming only 108 watts! More effective coverage area than any reflector series lights. perfect for a 2x2ft growing area at 24" height. The difference of us is that we use double cooling fans. Can most extend the light life. The PHLIZON 600W LED Grow Light comes with a free humid air monitor and thermostat, making it among the best LED grow lights under $100. It doesn’t have any reflectors, so this grows light has a lower risk of fire and other electrical issues. The PHLIZON 600W LED Grow Light is equipped with two on/off switches for both veg and bloom periods, so you can control the LED grow light with ease. The 430 to 740mm light used for Bloom period is vital for fruit and flower growth, while the 430 to 660mm light used for Vegetation period is essential for plant growth or germination. The grow light has two internal cooling fans. The fans are quite loud, but they do their work efficiently. You can use the thermostat to check the grow light’s temperature. It displays the temperature only in Celsius. There are different LEDs fitted inside the grow light to provide the plants with full spectrum light. Each of the 60 LEDs inside the grow light is a 10W LED. These LED lights work together to produce 600 watts of power. As such, the 600W LED Grow Light from PHLIZON is brighter than a 300W grow light. Each of the LEDs also has a viewing angle of 90⁰ to 120⁰, so you rest assured that all the plants will get light. The grow light can be used in 3 x 3 grow tents. After that, you may need to combine a few grow lights to ensure that the plants get enough light. You can daisy-chain the LED grow lights using only one wall outlet. PHLIZON’s 600W LED Grow Light has different PAR values over different heights. It can cover a 2′ x 2′ area when hung at the height of 24″. You can vary the height depending on the type, height, and growth stage of the plant. The 600W LED Grow Light comes with a 30-day money back guarantee and 2-year warranty. It consumes only 108W of electricity and has a viewing angle of 90⁰ to 120⁰. The grow light can replace a 400W HPS/MH. It measures 15.7″ X 6.7″ X 2.3″ and weighs 4.85 pounds. The package includes a power cord, thermometer and humidity monitor, Phlizon LED grow light, adjustable rope and hanging hook kits. The manufacturer did not disclose information about the product’s lifespan. 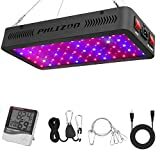 However, if you consider the bright full spectrum light, free items and savings that you can get, the Phlizon 600W LED Grow Light is still a great deal. The VIPARSPECTRA Reflector-Series LED Grow Light (300W) is reliable. When hung at the height of 24″, the grow light will provide you with a coverage area of 2′ X 2′ during Veg Period and 1.5′ x 1.5′ during Bloom phase. The LED grow light has an average power draw of 136W. The LEDs have a lifespan of 100,000 hours and can replace a 250W HPS/MH. It measures 12.6″ X 7.9″ X 3″ and weighs 5.6 pounds. The package includes a 6′ power cord, user manual, hanging kit and Viparspectra 300W LED Grow Light. The grow light has a perfect balance of coverage and PAR value. It provides the plants with enough light to produce better yields and grow faster. The VIPARSPECTRA Reflector-Series LED Grow Light features 60 pieces of 5W LEDs from BridgeLux and Epileds. The outer design is made of aluminum, which serves as a heat sink and eliminates the hot air. The grow light has built-in cooling fans that prevent overheating. The manufacturer claims that the Reflector-Series LED Grow Light runs almost 70% cooler than other lighting systems. You can do daisy-chain a few of them together. VIPARSPECTRA’s grow light also comes with a 3-year limited warranty and 30-day satisfaction/ return guarantee. It is cheap and lightweight, so you will not have any problem transporting the grow lights. However, the VIPARSPECTRA Reflector-Series LED Grow Light is not waterproof and can’t work when the temperature is over 40⁰. 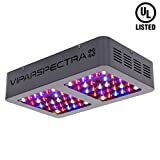 If you are looking for an affordable LED grow light that can still provide an excellent performance, you should consider the Reflector-Series LED Grow Light from VIPARSPECTRA. These are only some of the best LED grow lights under $100 today. Consider your needs, grow area as well as a budget when choosing a grow light. You should also check the grow light’s warranty. An extended warranty shows the brand’s confidence in their product. You can also read the reviews of those who have already used the grow light. LED grow lights are a good option for those who want to change their hot HPS lights into something that runs cooler. The more powerful LED models that produce a significant amount of heat are equipped with cooling systems to help maintain the temperatures inside the grow area. You will usually get better results with several smaller LED panels than a few large LED panels because more panels make it easier to spread the light to where it is required. For instance, two 125W LEDs will often give you better results than one 250W LED model. LED grow lights must be appropriately used to get your desired results. This lighting system is easier on the electricity bill and allows you to hang the lights directly over the plants without worrying about ducting, ballasts or fans. It is easier to keep the temperature inside the grow area. Some growers also believe LED grow lights produce higher quality buds. It tends to bring out the color and natural smell and taste of buds. With the right grow light, your cannabis will grow healthy and fast (Read our guide for selecting the right nutrients for your plant).